The following editorial content was originally published here. One of the hottest startups I know in this area is Insilico Medicine. Leveraging AI in its end-to-end drug pipeline, Insilico Medicine is extending healthy longevity through drug discovery and aging research. Their comprehensive drug discovery engine uses millions of samples and multiple data types to discover signatures of disease and identify the most promising targets for billions of molecules. These molecules either already exist or can be generated de novo with the desired set of parameters. Insilico’s CEO Dr. Alex Zhavoronkov recently joined me on an Abundance Digital webinar to discuss the future of longevity research. Insilico announced the completion of a strategic round of funding led by WuXi AppTec’s Corporate Venture Fund, with participation from Pavilion Capital, Juvenescence, and my venture fund BOLD Capital Partners. What they’re doing is extraordinary — and it’s an excellent lens through which to view converging exponential technologies. You’ve likely heard of deep neural nets — multilayered networks of artificial neurons, able to ‘learn’ from massive amounts of data and essentially program themselves. Build upon deep neural nets, and you get generative adversarial networks (GANs), the revolutionary technology that underpins Insilico’s drug discovery pipeline. What are GANs? By pitting two deep neural nets against each other (“adversarial”), GANs enable the imagination and creation of entirely new things (“generative”). 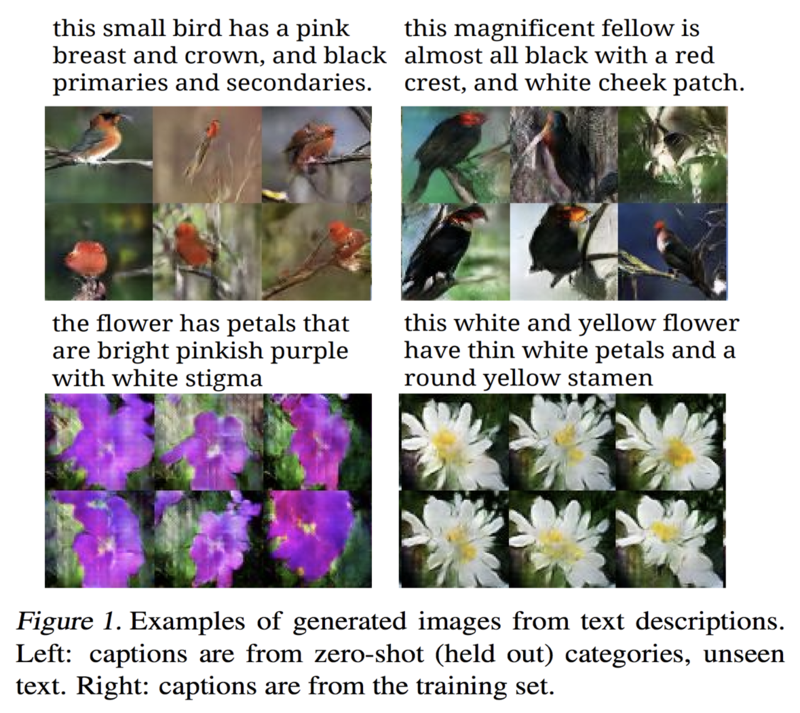 Developed by Google Brain in 2014, GANs have been used to output almost photographically accurate pictures from textual descriptions (as seen below). Insilico and its researchers are the first in the world to use GANs to generate molecules. “The GAN technique is essentially an adversarial game between two deep neural networks,” as Alex explains. While one generates meaningful noise in response to input, the other evaluates the generator’s output. Both networks thereby learn to generate increasingly perfect output. In Insilico’s case, that output consists of perfected molecules. Generating novel molecular structures for diseases both with and without known targets, Insilico is pursuing drug discovery in aging, cancer, fibrosis, Parkinson’s Disease, Alzheimer’s Disease, ALS, diabetes, and many others. Once rolled out, the implications would be profound. Alex’s ultimate goal is to develop a fully-automated Health as a Service (HaaS) / Longevity as a Service (LaaS) engine. Once plugged into the services of companies from Alibaba to Alphabet, such an engine would enable personalized solutions for online users, helping them prevent diseases and maintain optimal health. But what does this tangibly look like? Within this first pipeline stage, Insilico can identify targets, reconstruct entire disease pathways and understand the regulatory mechanisms that result in aging-related diseases. This alone enables breakthroughs for healthcare and medical research. But it doesn’t stop there. After understanding the underlying mechanisms and causality involved in aging, Insilico uses GANs to ‘imagine’ novel molecular structures. With reinforcement learning, Insilico’s system lets you generate a molecule with any of up to 20 different properties to hit a specified target. This means that we can now identify targets like never before, and then generate custom molecules de novo such that they hit those specific targets. At scale, this would also involve designing drugs with minimized side effects, a pursuit already being worked on by Insilico scientist Polina Mamoshina in collaboration with Oxford University’s Computational Cardiovascular Team. One of Insilico’s newest initiatives — to complete the trifecta, if you will — involves predicting the outcomes of clinical trials. While still in the early stages of development, accurate clinical trial predictors would enable researchers to identify ideal preclinical candidates. That’s a 10X improvement from today’s state of affairs. The digitization and dematerialization of drug discovery has already happened. Thanks to converging breakthroughs in machine learning, drug discovery and molecular biology, companies like Insilico can now do with 50 people what the pharmaceutical industry can barely do with an army of 5,000. As computing power improves, we’ll be able to bring novel therapies to market at lightning speeds, at much lower cost, and with no requirement for massive infrastructure and investments. These therapies will demonetize and democratize as a result. Add to this anticipated breakthroughs in quantum computing, and we’ll soon witness an explosion in the number of molecules that can be tested (with much higher accuracy). Finally, AI enables us to produce sophisticated, multitarget drugs. “Currently, the pharma model, in general, is very simplistic. You have one target and one disease — but usually, a disease is not one target, it is many targets,” Alex has explained. Inefficient, slow-to-innovate, and risk-averse industries will all be disrupted in the years ahead. Big Pharma is an area worth watching right now, no matter your industry. Converging technologies will soon enable extraordinary strides in longevity and disease prevention, with companies like Insilico leading the charge. Fueled by massive datasets, skyrocketing computational power, quantum computing, blockchain-enabled patient access, cognitive surplus capabilities and remarkable innovations in AI, the future of human health and longevity is truly worth getting excited about. Rejuvenational biotechnology will be commercially available sooner than you think. When I asked Alex for his own projection, he set the timeline at “maybe 20 years — that’s a reasonable horizon for tangible rejuvenational biotechnology.” Alex’s prediction may even be conservative. My friend Ray Kurzweil often discusses the concept of “longevity escape velocity” — the point at which, for every year that you’re alive, science is able to extend your life for more than a year. With a record-breaking prediction accuracy of 86 percent, Ray predicts “it’s likely just another 10 to 12 years before the general public will hit longevity escape velocity.” How might you use an extra 20 or more healthy years in your life? What impact would you be able to make? The post Artificial Intelligence Could Be The Key To Longevity [Affiliate] appeared first on Futurism.